Let’s face it: Washing dishes by hand is the absolute worst. First off, the mildewed puck which passes as your kitchen sponge always seems a few days away from sprouting legs; it’s not exactly something you want to scrub any dinner plates with. If that’s not enough, the running water you use typically fluctuates between boiling lava hot and just lukewarm enough to foster the convenient spread of bacteria. Perhaps even more annoying than these very manageable set of variables is the sheer act of having to expend elbow grease (and precious Netflix time) to clean plates manually. A dishwasher will help keep your kitchen sink spick-and-span. But like most things on the open market, sifting through the sea of available dishwasher options is frustrating and exhausting. To help you get a better grasp on the latest and greatest dishwashing options, and narrow down your choices, we’ve taken to the task of finding the finest dishwashers worthy of any kitchen. So say goodbye to scalding water and that petri dish of a sponge; here are the four best dishwashers available. Why you should buy this: With so many features and a great price, this dishwasher has it all. With top-rack bottle jets, separate wash zones, and more, this GE washer gets the job done. One of the best features on the GE GDT655SMJES dishwasher is the bottle jets in the top rack. Instead of the usual tines, there are two jets made for bottles and other tall items; water sloshes around to help get out whatever’s inside. 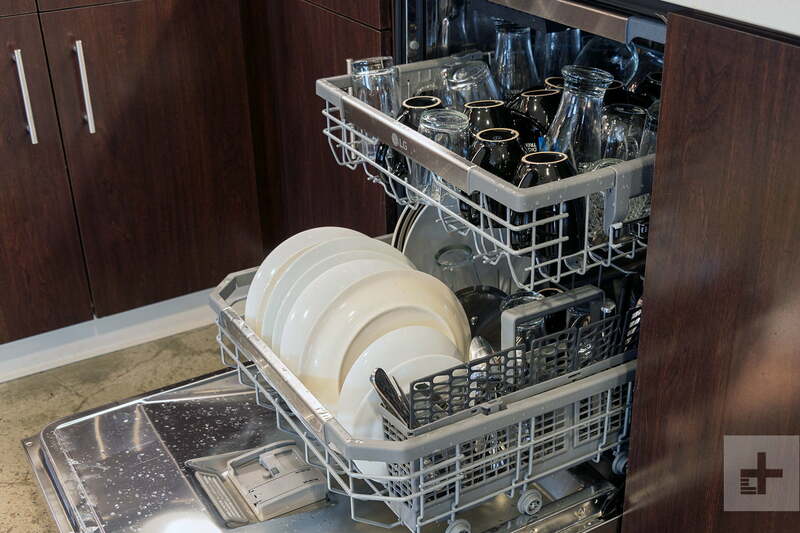 But there are other great features on this dishwasher that put it at the top of our list: It has separate wash zones, so can clean just the top or bottom rack when you don’t have a full load. There’s also a 32-minute express cycle, a steam prewash option, and an NSF-certified, germ-killing sanitization setting. Its stainless steel interior holds 16 place settings, and the dishwasher runs at an impressive 46 decibels. It’s not the quietest dishwasher on the list, but you still might be glad that there’s an indicator light, so you’ll know it’s running. The dishwasher is Energy Star certified and should cost around $32 a year to operate, depending on your utility rates. With a range of unique features, including several ways to boost its cleaning and drying power, this is both a powerful and affordable dishwasher, especially when you can find it on sale for around $600. Why you should buy this: Though it uses less water than many others, it delivers clean dishes. Though it operates in a European way, this Bosch is an Energy Star in every way. There’s a lot to love about the Bosch 500 Series and some things that take a bit of getting used to. It’s a European-style dishwasher, so it has a filter instead of a hard food disposer, like many American dishwashers. It also dries far better when you use a rinse aid to help the water evaporate. Energy Star-certified dishwashers use 4 gallons of water or less per cycle, and this Bosch has it down to 2.9 gallons. Its yearly energy use will cost you about $27, and it’s one of the quietest dishwasher on the list at 44 decibels. Like the GE dishwasher, it has an NSF-certified sanitization cycle and can hold 16 place settings in its stainless steel tub. It also boasts a few high-end touches, like an info light that beams onto the floor and a third rack for more flexibility when it comes to utensils. Bosch scores very well in dependability in both Consumer Reports’ and Yale Appliance’s lists. Why you should buy this: This dishwasher gets the dirtiest dishes spotless. With four washing arms instead of two, the Quadwash will get the dirtiest dishes spotless. Who’s it for: Anyone seeking a quiet dishwasher with superior cleaning skills. How much will it cost: $777, although we’ve seen it for cheaper. With four cleaning “arms” instead of two, this dishwasher is an impressive performer that is quiet and features adjustable racks. When we read in the LG guide that we should put dirty dishes directly into the dishwasher without rinsing, we said, “Oh, it’s on!” We smeared plates with condiments and let them dry, then put them all in the Quadwash. To our surprise, the dishes came out sparkling clean — even when we ran them into the turbo cycle. The dishwasher is quiet, so quiet, in fact, that we barely could tell when it was running. Tiny indicator lights just below the handle gave us an inkling, although we sometimes accidentally opened it a couple of times. This dishwasher features three racks – one small one for cooking utensils and knives on the top, a middle rack for bowls and glasses, and a bottom rack for larger items. All three racks are adjustable in case your glasses are taller, or you want to wash a large pot on the bottom rack and need more room. Of all major appliances, dishwashers are among the easiest to tell when they’re not doing their job. Sopping or food-encrusted dishes mean something’s not right, but it might just be your loading technique. Some dishwashers need rinse aid or they’ll leave everything wet, thanks to their condenser drying mechanisms. Modern detergent actually reacts to the enzymes in food, so if you pre-rinse your dishes, it won’t properly activate. Your owner’s manual has diagrams of how you should position your dishes so that the spray arm can reach everything and keep your dishes and your dishwasher clean. When we test dishwashers, we use both benchmarks and less objective metrics like design. Of all the appliances we test, dishwashers get the most feedback from the Digital Trends office staff. They get used several times a day by everyone in the office, and they let us know when things aren’t getting clean, when the near-silent operation and small status light have led to them pulling the door open mid-cycle, and so on. We also use more rigorous tests, based on AHAM’s standards, to ensure our results are repeatable and comparable.